Having a strong social media presence is a must for business success. Social media helps level the marketing playing field and creates a global market, allowing you to reach your audience where ever they are. There are a lot of social platforms to choose from and managing multiple social networks can be difficult. There are several platforms that help make this task easier. The two most popular are Buffer and Hootsuite. Both are great tools for your social media strategy and campaigns. Using either one requires an investment in time and money, and making the right choice can be crucial to your success. In this article we’ll compare Buffer and Hootsuite to help you decide which social media management platform is right for you. 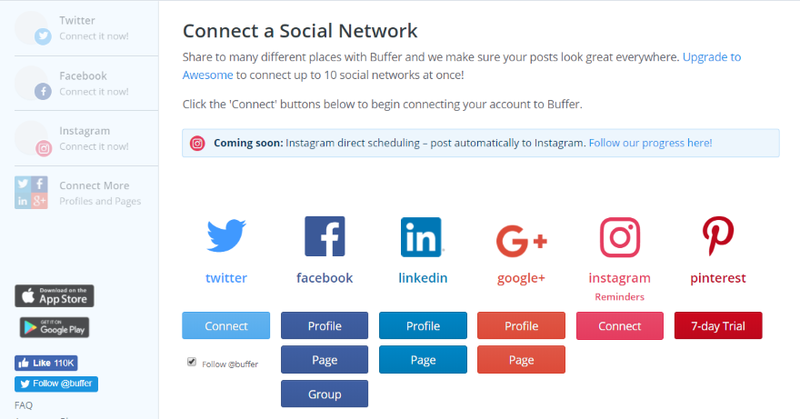 The free version of Buffer connects 3 accounts for five networks: Facebook, Instagram, Twitter, LinkedIn, and Google+. The premium edition adds Pinterest and can connect up to 150 accounts. Accounts can include profiles, pages, groups, etc. 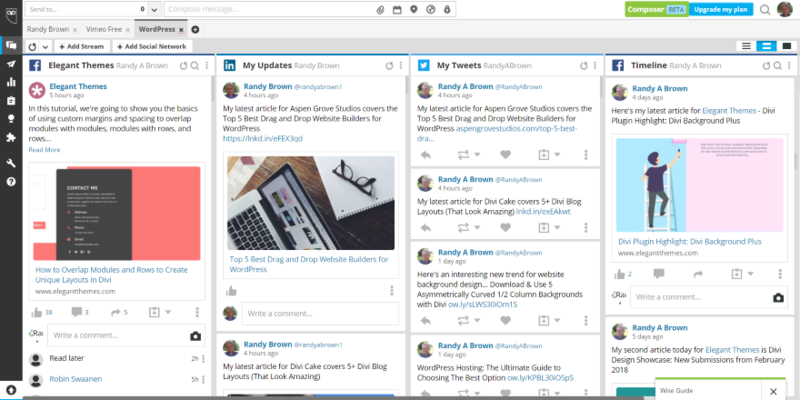 The free version of Hootsuite connects three profiles with any three of six networks. One of them has to be Twitter. The premium editions connects 10 profiles or more to over 35 networks. Buffer’s interface is simple and clean. After logging in, you’re presented with a content creation area where you create your posts. Either post immediately or use the scheduling tool to have Buffer post for you at the best times for each network. Schedule up to 10 posts per profile with 3 profiles for the free version. You can also schedule from mobile and post from a Google Chrome extension. Add featured images with Pablo, a stand-alone tool from Buffer. Hootsuite’s content creation takes a couple of clicks after logging in. You have to click to schedule a message, which gives you the content creation area. Create your content and either save as draft, schedule manually, or auto-schedule. It doesn’t seem have an instant publish feature. Schedule up to 30 messages in the free version. You can expand your reach with ads. 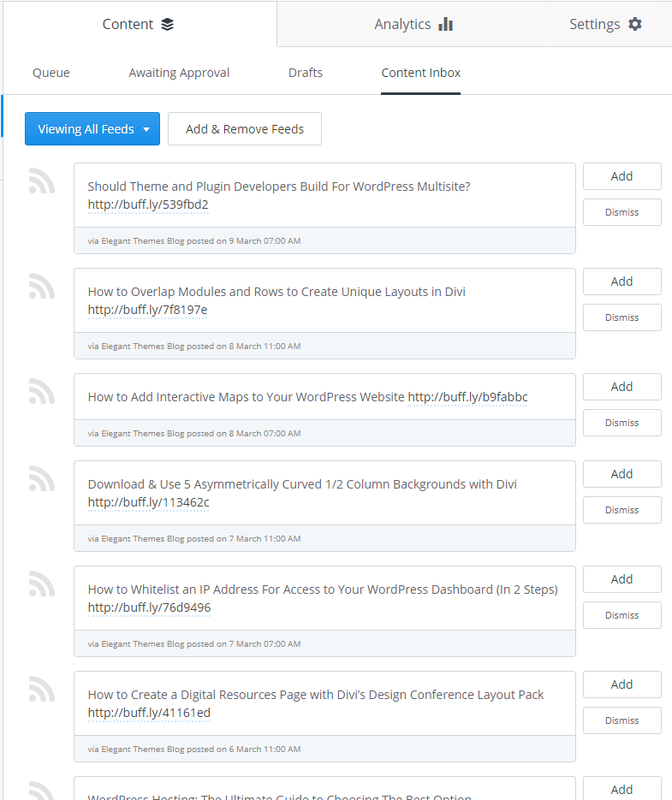 There are several ways to curate content for use in Buffer. One option is to use RSS feeds (requires upgrade). Add as many feeds as you want and then add anything from those feeds to your Buffer queue with a single click. Another method is to use something like Feedly and then use the Buffer Chrome extension to post to your Buffer queue. A mobile solution is to use an app called Pocket. 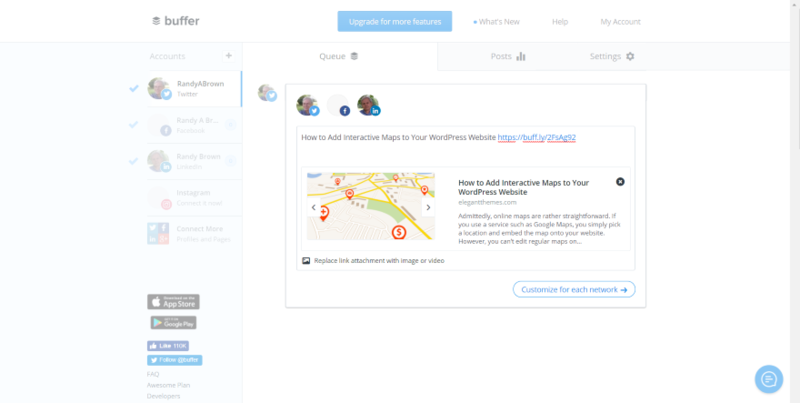 Hootsuite’s free account lets you create custom streams of content from your connected networks. Streams can include your home page, those you follow, those who follow you, specific pages, etc. You can add as many streams as you want. Interact with the content and repost from these steams. Add more types of streams and networks with free and premium add-ons. Buffer’s Business plan lets you add team members. The number of members depends on the plan you have. Give them admin access if you want them to manage social accounts and other team members. Set their access level to full posting or approval required. Assign them to any accounts you want. Hootsuite’s Team plan or above adds team management features. The number of members depends on the plan you choose. Create teams and manage who has access to which social accounts and what their permission levels are for each one. Assign tasks to an individuals, teams, departments, or regions. Provide the team with a library of pre-approved content (requires Business plan). You can communicate with the team using add-ons. Buffer provides an API with libraries so you can create apps to connect with Buffer. They also have a list of extras, which are external apps that work with Buffer. They include apps such as IFTTT, Feedly, Pocket, ReviewPush, Scoop.it, etc. 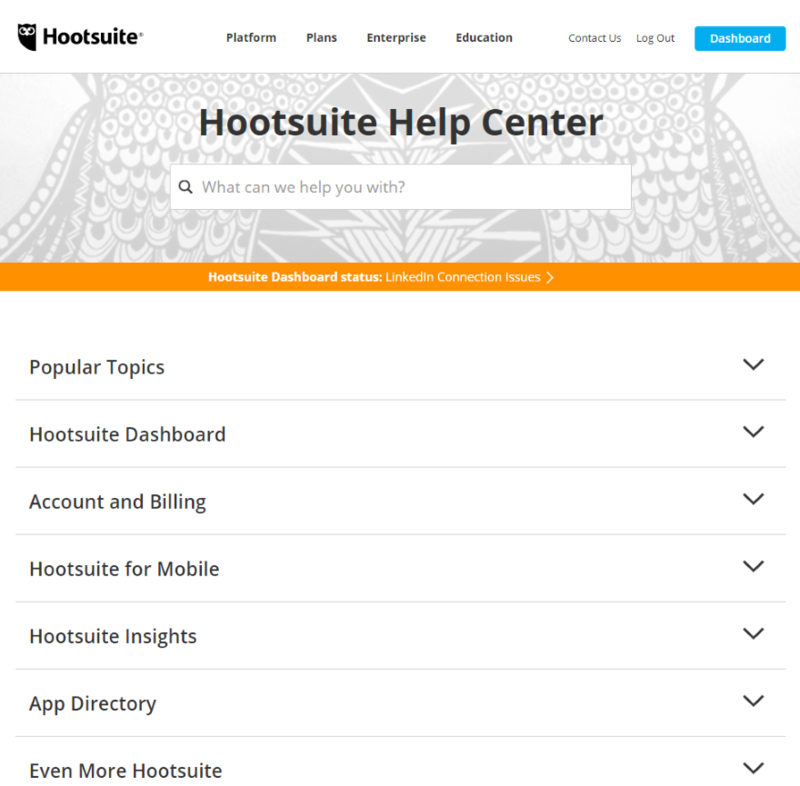 Hootsuite is expandable through free and premium apps that install into your dashboard. Add Slack, Trello, Tumblr, MailChimp, Vimeo, Flickr, SoundCloud, Hootsuite Campaigns, Hootsuite Insights, and lots more. The apps are rated and reviewed by users so you can get an idea if it will work for you. Buffer’s premium plans include analytics. 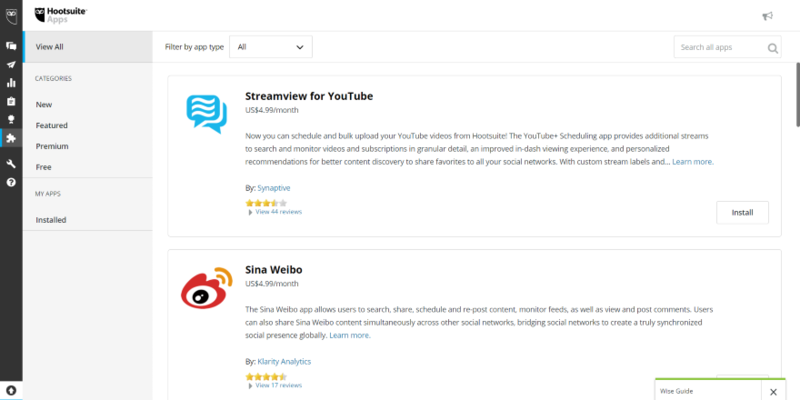 See stats about your posts for each network, view analytics by date-range, and see analytics for influencers. Each of the stats can be exported. The influencer’s analytics provides some powerful search tools. They allow you to choose stats for those who recently followed you, posted the most content, those that follow you but you don’t follow, those who’ve engaged with you, who’s sharing your content, and influencers by keyword. Hootsuite has various levels of analytics depending on the package you have and which features you add, but even the free version has some basic analytics. Build a custom report, Twitter profile overview, Facebook page overview, Facebook insights, Facebook aggregate, LinkedIn page insights, Google Analytics, and Ow.ly click summary. Edit your reports and export them. It includes lots of report modules to see specific things about each network. Get even more detailed analytics with premium plans and free and premium add-ons. Buffer’s training includes FAQ, guides and tutorials, case studies, webinars, and three blogs: social media, culture, and engineering. Webinars are live every Wednesday and Thursday and teach how to get started with Buffer Publish for Business and Buffer Reply. 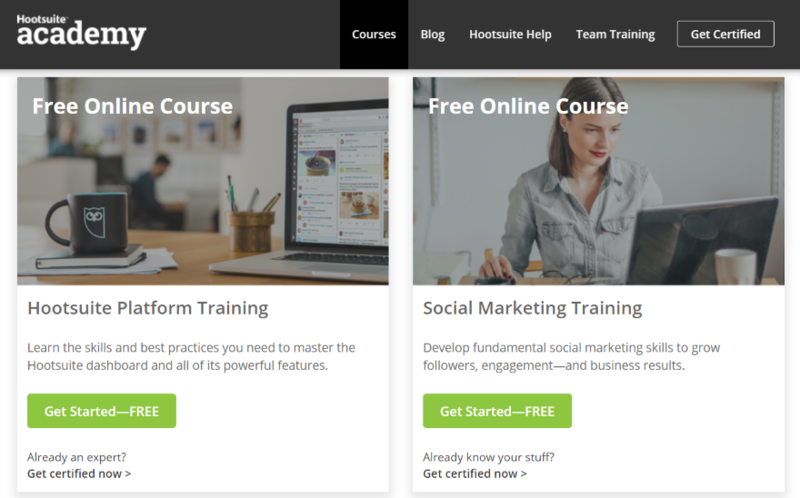 The Hootsuite Academy includes free and premium courses, blog, help, team training, and certifications. Courses include platform training, social media marketing, advanced social strategy, social media for healthcare, social selling, and advanced advertising. Some of their premium courses are in collaboration with online colleges and are accredited. Buffer’s support is world-wide but they don’t give a lot of details. It includes a FAQ with lots of detailed articles about Buffer Publish and Buffer Reply. You can tweet to them directly from your dashboard if you want support through Twitter. Buffer has 2 starter and 3 business plans, with each building on the last. Free – 3 accounts, 0 team members, 10 scheduled posts per account, 5 networks. Awesome – 10 accounts, 0 team members, 100 scheduled posts per account, 6 networks (adds Pinterest), RSS feed, calendar, analytics. Business – 25+ accounts, 5+ team members, 2000+ scheduled posts per account, 6 networks, RSS feed, calendar, advanced analytics. Hootsuite has 2 individual plans and 3 business plans – each building on the last. Free – 3 profiles, 1 user, basic analytics, 30 scheduled posts, 2 RSS feed integrations, app integration, online help, free courses. Professional – 10 profiles, 1 user, unlimited scheduling, bulk scheduling, real time analytics, sweepstakes, RSS integration. 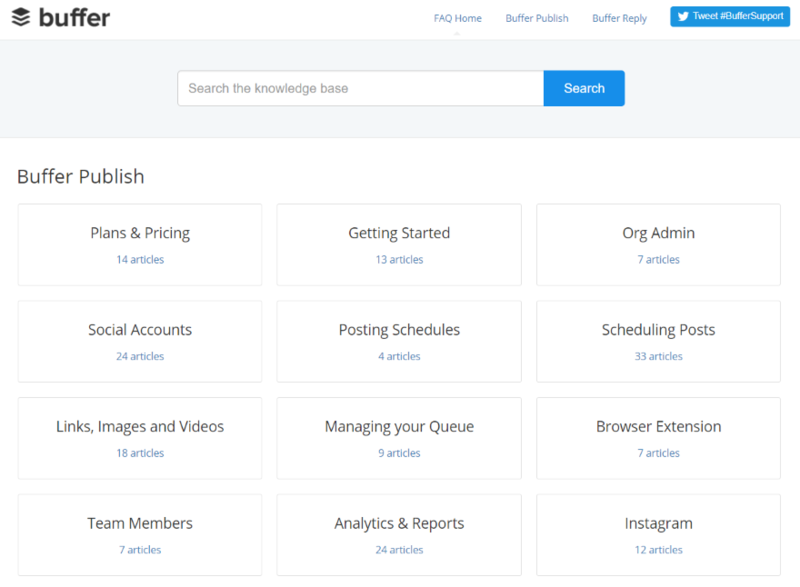 Business – 20+ profiles, 3+ users, various levels of custom analytics, team assignments, templates, branded URL, social media certification, support, training, premium integrations, etc. Here are a few pros and cons that stand out to me. The answer to that question will depend on what you need. Both are great choices and they do what they do really well. Both are a good value if they have the features you need. Here’s a list of the types of questions that might help you decide which is best for you. 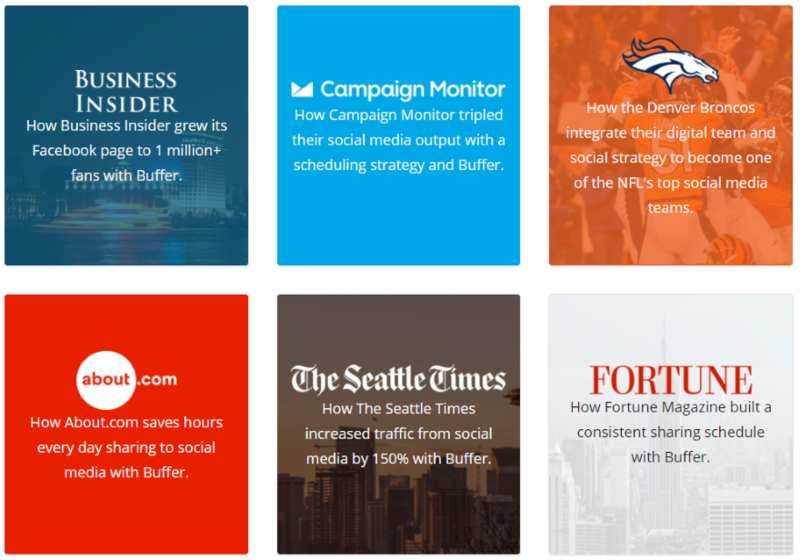 Buffer does fewer things than Hootsuite but it does them well. Simplicity can sometimes be more important than having a lot of features. 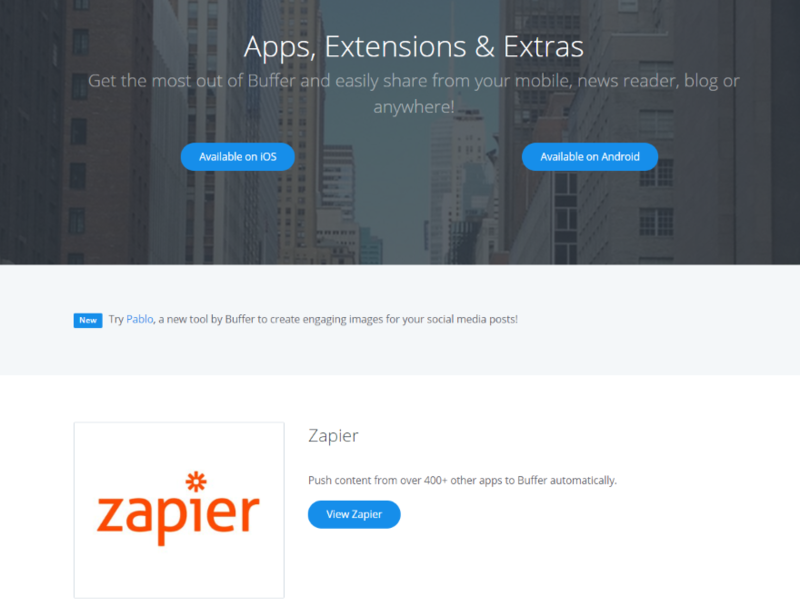 If you want to expand Buffer it’s best to use external apps that work with Buffer. Hootsuite has more of everything- more platforms, integrations, analytics, etc. Hootsuite provides these tools in one place, but many of them are premium expansions. Both have excellent blogs and tutorials to teach all in the tricks of using their platforms. I enjoyed using both platforms. I liked using Buffer to post my own content because of its scheduling features. I liked using Hootsuite to see streams from websites and others that I follow. What do you think? Which do you prefer between Buffer and Hootsuite and why? Let us know in the comments. In the free version of Hootsuite yoy don’t need to use Twitter. I have one with a facebook page,, instagram and Google+. Very good articles, which allows me to know buffer, because I always use Hootsuite. Yes Hootsuite is good for following the other site thanks to the feed. Both are strong platforms, but I’m finding ContentStudio.io to be a game changer with their discovery and automation tools. If you factor Replug.io for ContentStudio, it certainly is a game-changer! I’ve been using Buffer for a long time now. And I’m experiencing a great success with social media generated traffic. Buffer suggests when to publish and where to focus. And all that gives me a complete peace of mind. Earlier, before using Buffer, I didn’t know how to use social medial platforms properly to generate traffic. I think now things are totally different that made me convinced “Social media is a great source of traffic, thanks to buffer”. Thanks again for the awesome read. I still love hootsuite though, but Buffer really rocks! Hootsuite takes the win for me. Long time user and now with Instagram integration (posting direct from dashboard to business accounts on Instagram) it’s a no-brainer. Love the streams to keep track of accounts without signing on to each one! Buffer is rolling out Instagram Direct Scheduling this week. Available to all users, including free. For startups , Buffer would be great for the simplicity and pricing plan. I see a lot of comparisons between the two. For me, the difference is simple IF YOU ARE USING THE FREE VERSION ONLY! Hootsuite enables you to monitor, curate and evaluate from one place, as well as schedule posts. Buffer is easy to use, but is not much more than a simple scheduling tool, although the plug-in for Chrome is incredibly useful. Once you start looking at paid for then it’s a different ball game, but if you’re talking small businesses, I’d probably recommend you go with both, and just use Buffer through the chrome plug-in and Hootsuite for everything else. Great article, I am just about to jump into the world of scheduling, I have been trying to find out which would be best for me. Buffer is looking good but with free version it just sends you a reminder to post on Instagram it does not do it for you. I am not sure if Hootsuite allows you to post directly with video content. Think I am gonna try Buffer first see how that goes see if i get any tangible results.